Hello! 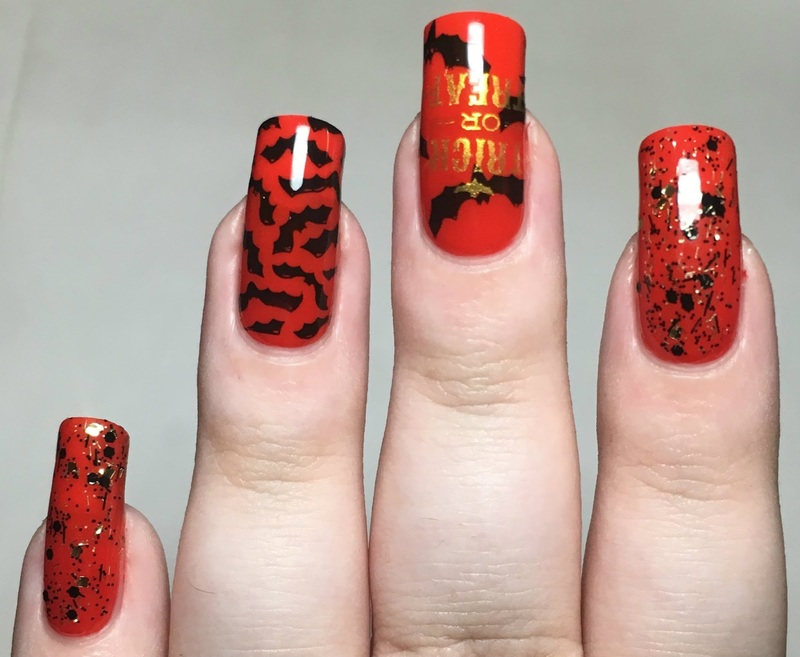 Today I have a quick Halloween mani to share. Earlier this month I posted several iZ Beauty of London polishes that are perfect for this time of the year (if you missed that post, you can find it here). One of the polishes was glitter topper 'V.I.P', which I swatched over red. I loved the combination so much that I recycled it into the Halloween look below. Read on for more info! I started with a base of Pretty Serious 'Stud Muffin', a bright red from the Pet Names Collection. This is smooth and easy to apply, and has a slightly more jelly-like formula. it does start off a bit sheer, but builds up nicely and has that gorgeous, squishy looking finish. Below is three coats with topcoat. I added one coat of iZ Beauty topper 'V.I.P.' over both my pointer and pinky nails. 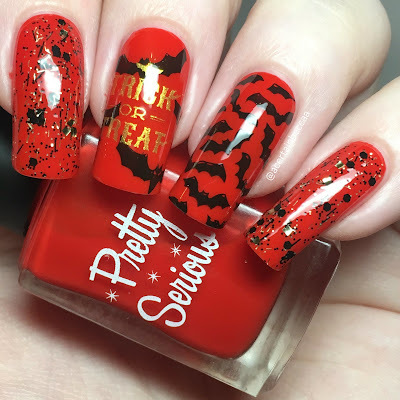 I complimented this with gold and black stamping, using images from UberChic Beauty plate Halloween 01. I used Hit The Bottle 'As Black As Night' to stamp some of the bat images to my middle and ring nails. Finally, I added the Trick or Treat image to my middle nail using a Born Pretty Store gold stamping polish. What do you think? This feels a bit different to my recent Halloween looks, but I quite like it! I think the gold and black contrasts nicely against the red base. 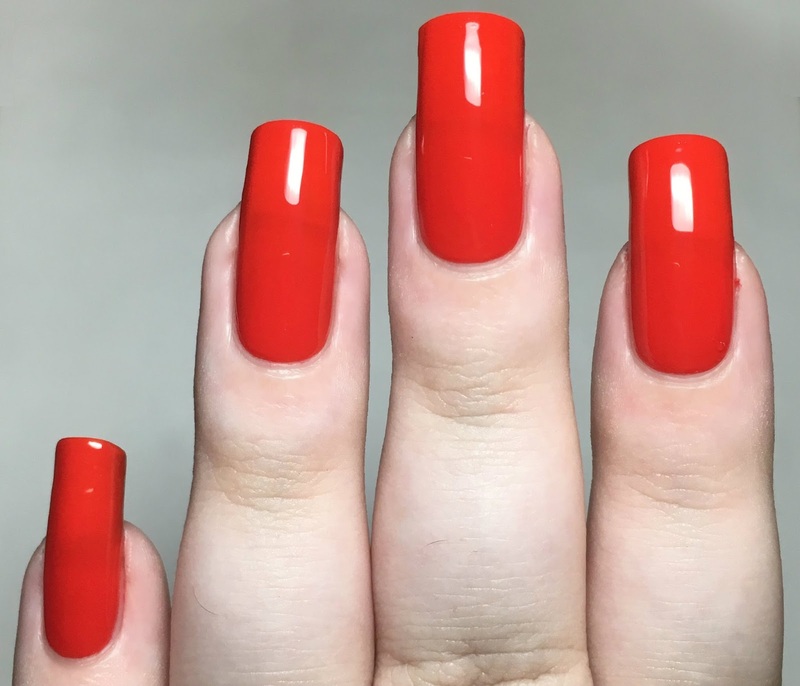 Halloween and the end of October are approaching quickly, so the Halloween nails will soon be finished for another year. I do still have a few more to share though, so stay tuned!